Oracle Business Activity Monitoring (BAM) is a powerful business friendly tool to support governance type of intelligence. Oracle acquired BAM as part of the PeopleSoft take-over in 2006. It was a hidden gem, which came out as a surprise. Having it’s first implementation in .Net, subsequently transferred to a Java implementation as part of the SOA Suite 11G, and now in 12C is completely reengineered to be completely integrated with BPM, SOA and Oracle BI and is highly scalable and easily managed. · At a tactical level when looking back in time when looking for process, product and knowledge improvement. Oracle Business Analytic Monitoring (BAM) is aimed at providing real time insight in operational intelligence or ‘right’ time intelligence as named by Oracle. BAM relates mainly to the governance type of information but also provides some aspects of operational and tactical information. – In the governance information area it provides direct insight in KPI’s and workload. – In the operational area risk analysis provides functionality for monitoring risk areas. BAM provides insight in analytics in risk areas. This is typically used in incident type of cases, where one needs to be aware of an increasing level of an incident happening. When an incident occurs, you need to be able to directly act upon this event happening. Part of this analytics can be fed into the execution of the case dealing with the event, and deliver information on and operational level. Another dimension of this analytics can also be used as tactical information to see where the handling of the case/processes and the product details can be improved. 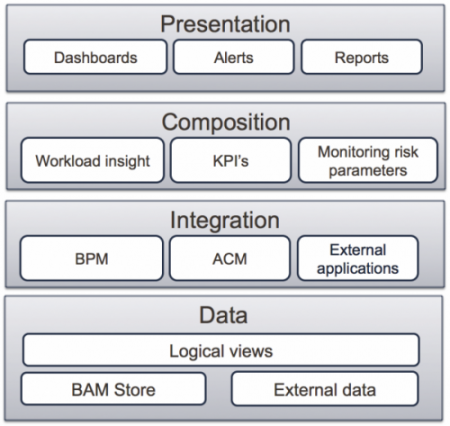 The functionality of BAM is aimed at delivering insight in KPI’s, workload and the monitoring of risk parameter. This data can be delivered from within BPM and Adaptive Case Management applications for which out-of-the-box functionality is available. Data also can be extracted from external applications. 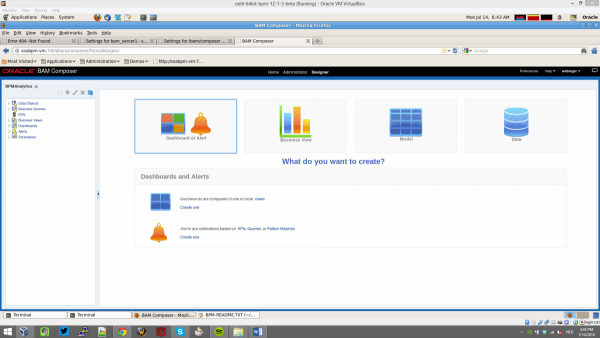 The functionality is presented in dashboards and reports. Based upon the monitoring of risks, alerts can be raised that spawn of further activities. Oracle BAM is based upon already existing Fusion Middleware building blocks. 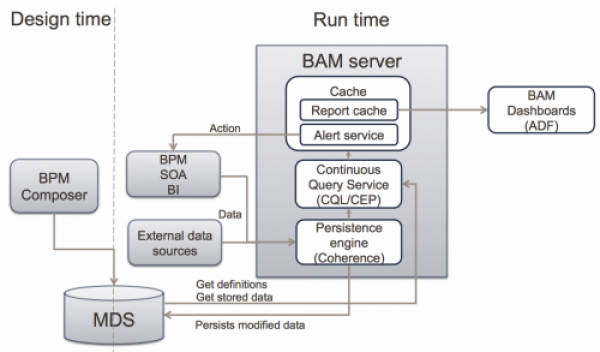 The main underpinning technologies for BAM are Oracle Coherence, the in-memory grid database, Complex Event Processing, aimed at listening at data streams, and ADF, the standard User Interface across the complete Oracle Fusion Middleware/Applications stack. The Oracle Database is used to keep the Meta Data Store, the repository where design and run-time artifacts are stored. The BAM technical architecture contains two main parts, the design part and the run time aspects. The design time aspect supports the business with a browser based solution to create the workload and KPI models, queries, dashboard and alerts that are used in BAM to present the relevant information. These models and definitions are stored in the Meta Data Store (MDS), which is the shared repository by BPM, Adaptive Case Management and BAM. Once the business analysts brought in the models, more technical persons need to add the details data models and from where all the data resides, through data source definitions and queues. After the design model is created and the BAM products are brought in production, data is being brought in by the data sources in the Persistence engine, which is Oracle Coherence based. BPM, SOA and BI information is brought in via native and pre-defined bindings. External data sources can provide information via Database adapters, Web services calls or queues. The Persistence engine then passes the information to the Continuous Query Service (CQS), which is a query engine that has the ability to listen to a data stream, both part of the persistence engine as well as already stored data. Every time a change occurs, the CQS investigates which queries are affected by the change, and related to the CQS which dashboards need to be updated, and pushes the information to the report caching engine which pushes the result to all (open) dashboards. The CQS also pushes the changes to Alert services related to the change, which in turn initiates an action, for instance start a new process. As described above the run-time characteristics of BAM are hugely improved and aimed at receiving, processing and presenting high volume data at the ‘right’ time. The 11G version was already capable of delivering data ‘near’ real time, with the inclusion of Coherence and Complex Event Processing the performance feature is hugely enhanced. With the usage of ADF as the front-end, finally, all browsers are supported. In the previous versions only Internet Explorer was supported, which for me as a Mac user was a pain. This blog text is part of the upcoming book “Oracle Case Management Solutions”.